After years of delays there is now some solid movement on the National Shipbuilding Procurement Strategy (NSPS). The initiative, now referred to by the federal government as the National Shipbuilding Strategy or NSS, is the largest maritime building program since the Second World War and represents a massive amount of work for potentially large numbers of Canadian companies. Irving Shipbuilding has been selected by the government to construct 21 combat vessels under the NSS, while Seaspan will build the non-combat vessel work package of 7 vessels in total. The first-ever large vessel designed and built under the NSS — one of the Canadian Coast Guard’s Offshore Fisheries Science Vessels (OFSVs) — is expected to be launched in December by Seaspan’s Vancouver Shipyard. That ship is the Sir John Franklin. An event to celebrate the launch will be held December 8, noted Tim Page, vice president of government relations for Seaspan Shipyards. A second as-yet-unnamed OFSV will be launched in April 2018 and the final one in November of that same year. The Canadian Surface Combatant (CSC) project, also part of NSS, is moving forward, although arguably slower than first expected. Bids for the ships, which will be eventually constructed at Irving Shipbuilding Inc. in Halifax, were submitted on November 30. The CSC is the largest, most complex procurement undertaken by the government, according to Public Services and Procurement Canada. Bidding and construction have been delayed a number of times so far. At one point, construction of the vessels was supposed to start in 2018 but that milestone now seems to be a distant thought. The ships being built will form the backbone of the Royal Canadian Navy. Fifteen are to be constructed. Lisa Campbell, Assistant Deputy Minister for Defence and Marine Procurement at Public Services and Procurement Canada, said bids will be evaluated in early 2018 and the winner is to be determined later that year. Construction of vessels is expected to begin in the early 2020s, she added. The cost of the program is almost $62-billion, according to a study released in June by the Parliamentary Budget Officer. There is also work being done on the Joint Support Ship or JSS, another vessel to be built under NSS. Canada selected the German Navy’s Berlin-class design for the JSS fleet. Carter noted there are currently 1,200 employees at Vancouver Shipyards, where the non-combat vessels are being constructed. But he said that number would increase by another 300 once construction of the JSS fleet is underway. In the meantime, there are about 200 Seaspan staff dedicated to the JSS program at this point. The Department of National Defence has noted there has been a slight slippage in the delivery of the ships. In the 2014–2015 Departmental Performance Report, the target date for first delivery of the Joint Support Ships was in the last quarter of 2020. As a result of challenges associated with completing the detailed design and organizing the entire supply chain, the JSS first delivery date slipped by a number of months to early 2021, DND has pointed out. At the same time, the union representing workers at the Seaspan Shipyards is warning that some of those employees could be facing layoffs because of downtime in the federal government’s shipbuilding program. There is expected to be a gap between the end of construction of the third and fourth federal government vessels. Seaspan’s Page said the company is trying to drum up new work from the federal government and other commercial sources to deal with the gap. At Irving, besides dealing with the bids on the Canadian Surface Combatant project, the company is preparing the first Arctic Offshore Patrol Ship (AOPS) for launch. That is expected to come sometime in 2018. But Irving has also been dealing with growing anger in some quarters over its use of foreign workers on the NSS. In February, news reports detailed how the union representing shipyard workers was upset that Irving was hiring outside of Canada for various positions. There was recruitment in Poland as well as a subcontract Irving had with the Spanish firm Gabadi LC, which involved Spanish carpenters being brought in to work on the AOPS in Halifax. Irving responded that specific shipbuilding expertise did not exist in Canada and, under special circumstances, skilled workers had to be sought internationally. Union officials responded that they found it difficult to believe that no one in Canada could fill the needed positions on AOPS. On October 20 the Halifax Chronicle Herald published a new article about union complaints that 27 ironworkers had been hired from Lithuania and Romania for NSS. Unifor Marine Workers Federation Local 1, which represents employees at the company’s Halifax shipyards, told the newspaper that Irving had not provided proper justification for the hiring of the foreign workers. The issue is a thorny one since one of the main goals of the NSS is the creation of long-term shipbuilding jobs in Canada. On the sidelines of the NSS, but very much having an effect on the strategy, is the interim auxiliary oiler replenishment (AOR) ship that has been built by Davie shipyards for the Royal Canadian Navy. MV Asterix was unveiled on July 20 and will soon be ready for RCN operations. The $670-million project will provide the RCN for the first time since 2015 with its own capability to refuel and resupply its warships at sea. Since the retirement of its own aging resupply vessels (HMC Ships Protecteur and Preserver), Canada has leased the services of Chilean and Spanish navy supply ships at various times. MV Asterix, known as a Resolve-class naval support ship, will be the largest naval platform in service with the RCN for the foreseeable future and will provide a wide range of functions from at-sea replenishment of fuels and cargo to aviation support, fleet medical support, and humanitarian and disaster relief, Davie officials point out. The project involved the conversion of a modern, European-built containership into an auxiliary oiler replenishment ship, a process that was accomplished in about 18 months. In 2011, when Irving and Seaspan were selected under the shipbuilding strategy to construct new federal government fleets, Davie was in financial trouble. But the firm is now back on its feet and wants a share of the action in federal shipbuilding. Davie is looking for additional similar work and has proposed to convert another commercial ship as an RCN supply vessel, as well as provide an icebreaker and a humanitarian support ship. Such initiatives are seen by federal bureaucrats as a threat to NSS, but Davie argues that isn’t the case. 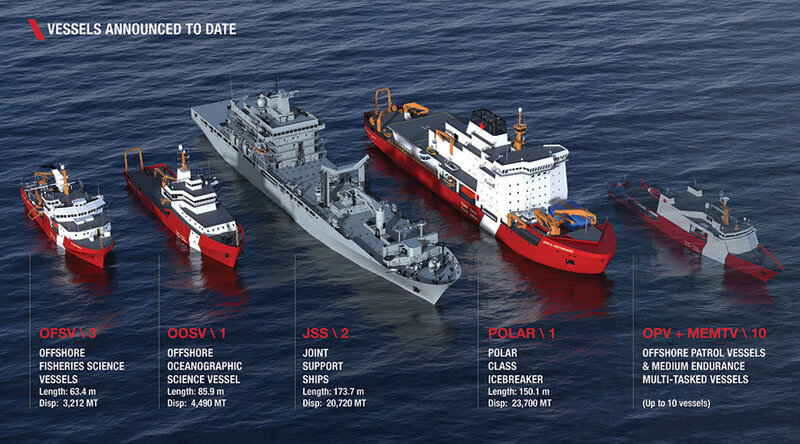 In addition, the federal government has put out requests for information about smaller icebreakers. Davie has those vessels already to go, according to a Davie representative. The company also has political support from some federal Quebec MPs and the Quebec government. On November 8, members of the National Assembly of Quebec unanimously passed a motion calling on the Trudeau government to amend what it was calling the faltering National Shipbuilding Strategy to include Quebec. Such a move would save 1,200 middle-class shipbuilding jobs, according to the politicians. He noted that the federal government has acknowledged that its ship fleet is rusting out faster than it can be replaced. Davie argued that the National Shipbuilding Strategy is costing taxpayers too much and is slow to produce vessels. Vicefield argues the shipbuilding strategy only covers a certain number and types of ships that would be built by Irving and Seaspan. But there are many more vessels that need to be constructed and that Davie should be given a chance to bid on those, company officials argue. Sources close to Davie say the Quebec government and unions are trying to mobilize Quebec Liberal MPs to put pressure on their government to change the shipbuilding strategy. But whether the Liberal government alters NSS to deal with concerns from Quebec and Davie remains to be seen.